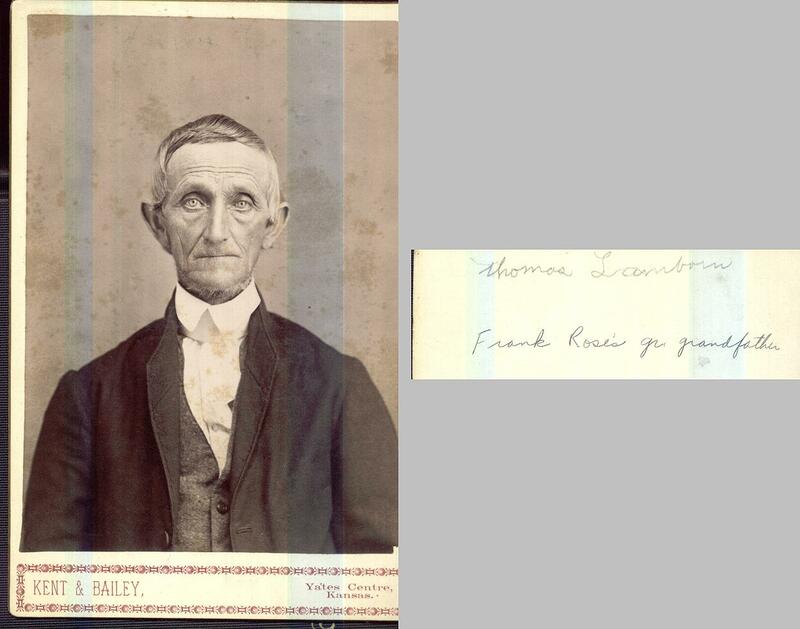 Comments: Thomas Lamborn (Nee: ) | Ks | 1851-1900 | Comments: Frank Roses Gr Grandfather ///submitted by Edsel Burdge Jr. 8/2004 - Thomas Lamborn (1821-1892) was originally a member of New Garden Monthly Meeting (MM), Chester Co., Pa. On 12 m. 16, 1846, he married Mary Hayes (1826—1919), daughter Isaac Hayes of East Marlborough MM. At some point they moved to Cayuga Co., NY. He was recorded a minister in Scipio MM (N.Y.) (Wilburite and later the subgroup of Wilburite Friends known as Otisite). In 1863, with feloow Quakers, Joseph Brinton, Joseph Hopkins, and James D. Otis, Lamborn visited President Abraham Lincoln. In 1865, he laid a concern before his meeting to be liberated for service in Great Britain. The Meeting for Sufferings did not unite with the concern. Lamborn refused to lay it down and elicited the support of a number of Friends in Ohio General Meeting, including Joshua Maule. As a result, Ohio GM split between the Maulites and Kollites (followers of minister Daniel Koll), with the Kollites identifying with the General Meeting of Pa., New York Yearly Meeting (Otisite), and Annual Meeting of New England. In N.Y., Lamborn broke with NYYM (Otisite) and held meetings in his home under the care of Ohio GM. At some point, Lamborn moved to Woodson Co., Kan., where he died. Information about Lamborn can be found in Joshua Maule, TRANSACTIONS AND CHANGES IN THE SOCIETY OF FRIENDS (1886), 274-292; A. Day Bradley, "New York Meeting at Poplar Ridge and the Primitive Friends," QUAKER HISTORY 68 (Autumn 1979): 76; Thomas Lamborn and Mary Hayes marriage, Friend (1 m. 2, 1847): 120. I have a photocopy of an account of his visit with Lincoln. I also have photocopies of several letters from Lamborn to Joshua Maule, taken from the Joshua Maule Collection at the Friends Historical LIbrary at Earlham College in Richmond, IN. ///DeadFred recieved these photos in the mail as a donation from bybuttonlady@yahoo.com . The donation contained three large manila envelopes filled with photos in a box. On eac envelope was hand written surnames with each envelopes group of surnames being different from the others . In the course of scanning them I found connections in names among them all therefore Ive decided to put them collectively in one group . If you click below you will be able to see all the photos that came in all three envelopes,. Ive added the search term Yarberry A,B,or C to the comment section of each photo to designate which names came in the envelopes together. Envelope A contained the following Surnames : Jenkins,Battey Whinery,Gross,Mendenhall,Pyle,Lambon ,Woolman . Envelope B: Hayes,Pyle,Lambon,Gross,Hogue,Rose .Envelope C:Ridlon,Hayes,Chenyney,Putnam, Smith,Walton,Mathers,Hilbe. If you go to the home page and type into the keyword yarberryB into the *comments search* section this photo group will come up These are a very nice collection of family photos. Write to bybuttonlady@yahoo.com if you have any questions about the people in the photos. Write Joe@deadfred.com if you wish to claim a photo , wnat an enlarged scan or have a question .